How do those Dutch do it? You probably know that the Netherlands has lots of cycling. They sure do! An amazing 27% of ALL trips* in this rich country in 2005 were by bicycle. Riding in the Netherlands is also remarkably safe. How did the Netherlands get to be such a cycling paradise? There are several rather unhelpful theories. "It is a flat country": No doubt this helps. 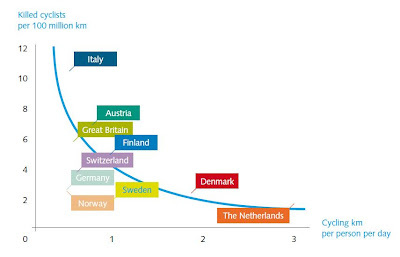 But there are plenty other comparable flat places with much less cycling. "The Dutch have a long-standing 'bicycle culture'": Certainly they do. But is this a cause or an effect? So did many other countries at some point in the 20th century. Yet most of them somehow lost their 'bicycle cultures'. "They have good weather for cycling": I hear this when I talk about cycling in hot and sticky Singapore. But I suspect this theory is only popular among people who have never spent any time in a damp and windy Dutch winter. A recent publication from the Netherlands might help. "Cycling in the Netherlands" (pdf) is an easy, non-technical read and is visually very striking. One of its key aims is to share with the rest of us the lessons learned from decades of experimentation with bicycle policy by various Dutch agencies and local governments. Based on the frequent requests for information from policy-makers, politicians and NGO’s from all over the world, we decided to produce a comprehensive brochure about cycling in the Netherlands, giving an actual overview on the results and findings of relevant studies and experiences. I also highlighted the document recently on the Cycling in Singapore blog. So what CAN the rest of us really learn from Dutch bicycle policy? Probably we can learn many things. But here is one key conclusion from the report ... bicycle policy works! [Update: a new website, Fietsberaad, will also be of interest for Dutch bicycle policy insights. This is "the brand new international website of the Dutch Fietsberaad (Bicycle Council), the expertise centre for cycling and all related subjects. This English website provides access to the most up-to-date information, the main facts and the best examples from the Netherlands and other countries."